Sometimes you wake up and consider devouring your kitchen. This was not good, since I was ready to do 35 minutes on the elliptical, and I couldn’t have a banana because of its binding agents! But I ended up powering through. This is the first time I’ve had the Silk brand almond milk. It’s the same nutritionals as the Original Almond Milk, so I figured I’d give it a shot. It is amazing! Creamy and sweet. I’ll definitely be buying this again. This smoothie was one of my best. The addition of the cocoa powder gave it a richness that my other smoothies sometimes lack. If you haven’t tried adding spinach to a smoothie, do it! It’s definitely not as bad as you think. You can’t even taste it. If you could, there’s no way I’d consistently throw a handful in there. I paired my Brown Cherry Monster with a Thomas English Muffin with a smear of Smart Balance Light and Stonewall Farms Caramel Apple Butter. They just put these in stock at my grocery store and I had to snap it up! I love apple butter so, so much, and the caramel added a luxurious touch. It took all of my willpower to put the jar back in the fridge and not just scarf the entire thing. Off to work, where I’ll order food from the restaurant menu. I’ll probably post tonight about how to stay healthy when you work in a place that serves deep-fried clams and cheesesteaks! 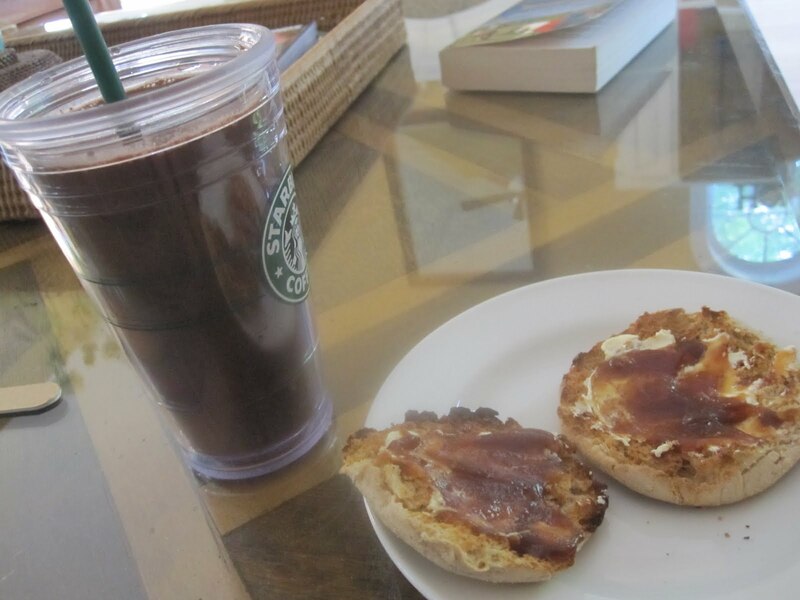 Just have to tell you that as a result of reading your blog I have re-discovered the joy of English Muffins. Love your creative ways to top them. This morning I topped mine with a spoonful of ricotta and a spoonful of tomato sauce, then sprinkled on a pinch of garlic powder and italian seasoning. Nearly instant breakfast pizza. Very filling and healthy, too.